Strike learns simple phrases to impress our Chinese guests coming to the island today! Home/News/Strike learns simple phrases to impress our Chinese guests coming to the island today! We are very proud of the reputation built over time, which is of a customer-oriented approach in our daily operations. The island staff team realise their clients’ experience of their island activity will be so much more comfortable if their clear instructions are understood. 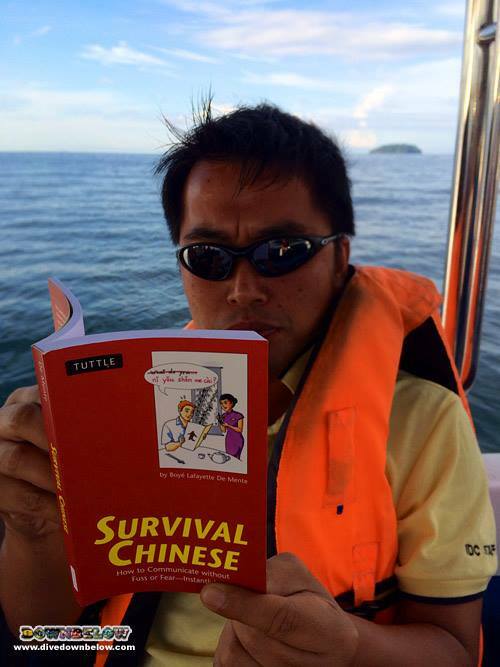 In Malaysia, the Chinese community is a large proportion of the cultural melting pot. For all Downbelow employees to learn some conversational Chinese can increase the likelihood of new clients in the future and retain our current clientele. The small efforts over time, displays a fantastic working attitude towards customer service and will be appreciated. Our high standard of customer service is evident from the first contact and many clients have complimented on our follow-up contact, so that we maintain our reputation. When you have decided you would like to visit our tropical shores at Gaya Island, or the many adventurous activities to explore Sabah, contact our friendly and helpful staff at our Kota Kinabalu Times Square Head Office. We look forward to your enquiry and designing your Sabah holiday! By Joanne Swann|2014-01-10T16:49:25+08:00January 11th, 2014|News|Comments Off on Strike learns simple phrases to impress our Chinese guests coming to the island today!